West Bengal Police Constable Recruitment 2019: The West Bengal Police is inviting all interested candidates to apply online for the WB police Constable Recruitment 2019. All the candidates are requested to apply online by sending in their duly filled West Bengal Police Constable Online Application form through the official website of the West Bengal @ wbpolice.gov.in before the last date on 5th March. The West Bengal Police Force is providing an amazing opportunity for all the candidates who are seeking a govt job in West Bengal. Kindly ensure that you go through this page and make sure that you are eligible for the post of Constable (Male) before you apply online. All candidates who are interested in securing a Police Jobs in India are urged that they make the most use out of this amazing opportunity. Keep in mind that this recruitment will be conducted to recruit male candidates in the post of Constable. Similar recruitment for female constables has already been conducted by the West Bengal Police force. 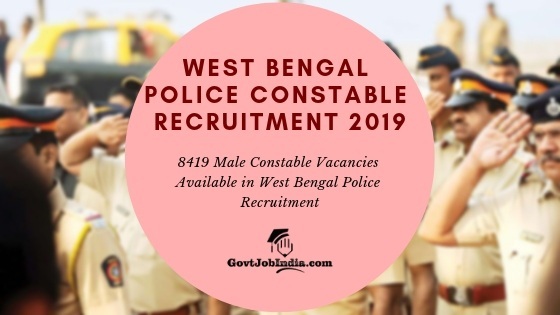 All the details you need regarding the West Bengal Police Constable Recruitment 2019 has been provided below. So keep on reading to get the latest news regarding the WB Police Constable salary, educational qualification, physical exam, and online application form 2019. Candidates are first required to visit the official website of the West Bengal Police @ wbpolice.gov.in. Once on the website, you can proceed to the Apply Online Section within the recruitment tab on the website. You can skip this procedure by clicking on the link provided below which will directly take you to the West Bengal Police Constable Online Application Page. Once on this page, start out by registering yourself on the website. Once you have registered, you will be able to access the West Bengal Police Constable Online Application Form 2019. Fill the form carefully without making any errors. Kindly ensure that all the details provided by you on the form are accurate. Once you have completed the form, you will be needed to upload a scanned copy of your passport sized photo and signature. you can do so by visiting the nearest cyber cafe in case you do not have access to a scanner. At the end of the application process, you will be required to pay the online application fees. You can complete the online application fee by submitting the fees through credit card/debit card/net banking. Kindly make sure that you complete your West Bengal Police Constable Online Application Form before the last date on 3rd March 2019. The opportunity provided by the West Bengal Police Constable Recruitment 2019 will truly help set up your career with the West Bengal Government. All the best for your application and we hope you find success in your attempt. In case you have any doubts regarding the recruitment, then make sure that you mention them down in the comment section. Our team will provide all the assistance you need.